Supplying me with your own photos, or asking me to visit and study your horse(s)? With this information, I can provide you with a fixed price (view prices) and timescale, in order for you to make a 50% deposit. 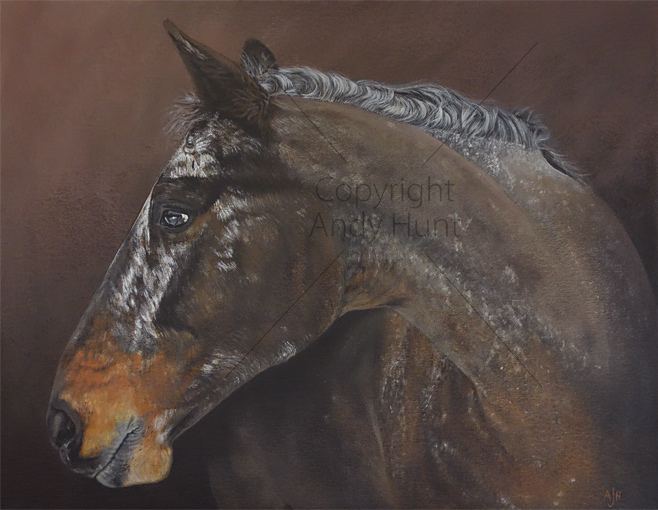 With the reference in place (photos supplied by yourself, or a visit to make studies at your stables), I then work on designing the composition and content of the painting, and email you a full-colour visual for the intended look of the finished item, for your approval. When the painting is complete, I email a photograph of the painting to you, for your approval. Should any adjustments be necessary, these would be implemented and re-proofed afresh. Once approved, I then take payment for the outstanding balance and arrange delivery of the finished painting (including framing, if required). 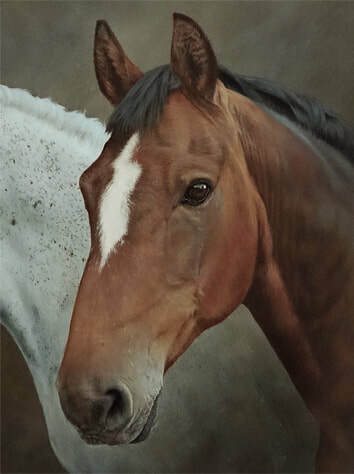 I can visit in person, to make my own studies of the horse(s) in question. If your horse is stabled too far for me to travel, I may be able to use the services of a local equestrian photographer, to take reference shots on my behalf. You don't need to know exactly how you want the painting before enquiring - I am happy to discuss ideas and options. 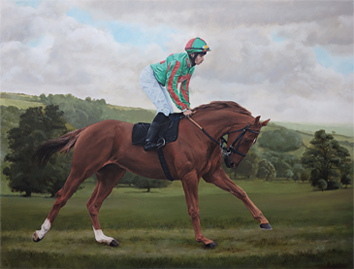 Please either email: ﻿andrew@finehorseportraits.co.uk﻿ or call me on 023 9241 0108. 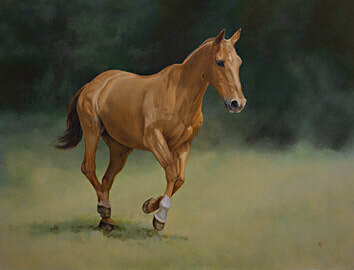 Whether you have some photos already, or intend to take some pictures especially for the painting, I can use your imagery to compose a well-balanced and attractive painting. • As long as your photos are clear and sharp, and of a reasonable size, I should be able to work with them. • It doesn't usually matter if you have busy or unattractive backgrounds, or other aspects of your photo that you don't like. I can exclude all these from the actual painting, which can have any background and composition, and can even be composed using reference from several different photos. • Essentially, there are usually several options for how I might make the most of your photos for a successful painting - I'm always happy to discuss ideas without any obligation. If at all possible, it is my preference to personally visit & study the horse in question. This enables me to get a really good appreciation for all the finer points of build, size, composure and character of your horse. • On the day of my visit, I would take time to make studies (photographic and/or sketches) and discuss these with you to establish how the painting might look, at a basic level. • You don't need to know exactly how you'd like the painting to look, in advance. • If your horse is stabled too far for me to travel, there is a further option to use the services of a local equestrian photographer to take reference shots on my behalf. 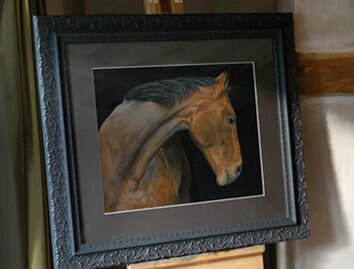 My paintings are produced on either stretched canvas or directly on board, and can be supplied as is, or framed and ready to hang on your wall. If you would like your painting to be framed, and having discussed your requirements / preferences, I can supply you with a range of frame choices for your consideration. Can you do my portrait painting urgently? As I work in acrylic paints rather than oil paints, this enables a painting to be supplied much faster, with no delay waiting for it to dry (Oil paintings can take weeks to dry). If at all possible, I will accommodate urgent requests, though this can only be answered when all circumstances are known, and balanced against my current workload. Should you have an urgent request, please contact me as soon as possible, and we can discuss what may be achieved. I am based on the central South coast, and if your horse is stabled more 3 hours drive away, then there are 3 options for obtaining the necessary reference photography. • If you can provide, or cover the costs of overnight accommodation (+ travel costs), then I am able to cover a large portion of the UK. • I can look for a suitable local equestrian photographer to take reference shots on my behalf. • You can supply your own photography. I mostly work in acrylic paint on canvas or board. My brush style is to apply quite thin layers of paint which are built up to achieve depth of colour and tone, and fine detail - this medium gives a finish very similar to traditional oils (see example above). Please note that although my preparatory compositions are usually completed on-screen, the actual painting is entirely hand-produced with pencils, paints and brushes!